• The engine with the normal looking fan is a Special / Super engine. • The engine with odd looking fan is a Century / Roadmaster engine. I've seen the odd looking fan on one Roadmaster engine, but have also seen several Roadmaster's with the conventional fan. What is the purpose or function of the odd fan configuration? I just tried a search for this topic but can't find anything. My first problem is that I don't know what this fan might be called. The pictures, below, are 1941 Buicks being assembled in Linden, New Jersey, USA. The 1940 Buick engine is likely painted in the same fashion - - - Engine color on the manifolds, a cadmium plated water pump pulley, the harmonic damper is fitted after the engine painting (but not sure of the color), the exhaust pipes are painted chassis black, the generator mounting bracket is painted engine color, and the fuel and vacuum lines are painted engine color. Great photos, thank you. Both exhaust and intake manifolds the engine colour? I know the muffler was coated in lead but didn't know the pipes were painted. It looks like in those photos that the lever arm shocks and steering box are painted black but I have seen really detailed 1940/41 restorations where they painted them a silver metal or cast iron colour. 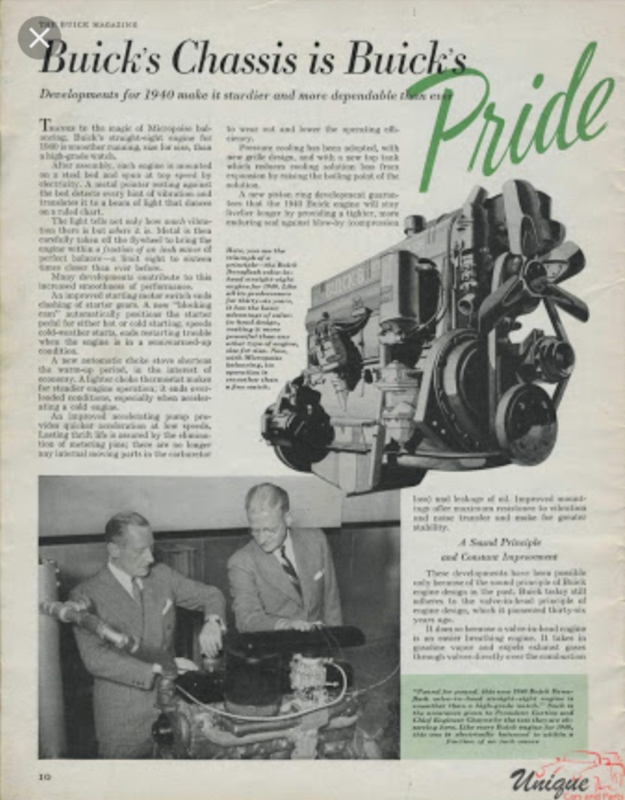 Below is an article on the 1940 model, wish i I find a clearer copy to read it. From what I can tell the water pump pulley is black which I what I painted mine. Only parts of the intake manifold are the engine colour and strangely the rocker cover is black, it was one used for testing?? anyway it definitely wasn't black for production. Not sure if the men are running the engine or not in the photo but if so I like how they do it in their nice suits and tie. 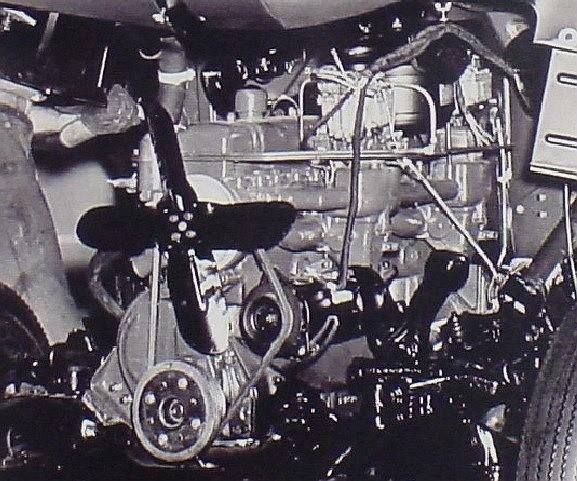 The odd looking fan on the 1941 Roadmaster engine is designed to produce less noise. From my experience with my 1941 Roadmaster, the fan may make less noise, but doesn't cool the engine very well. 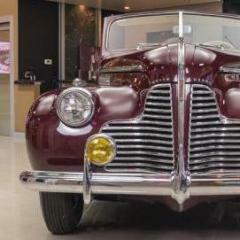 Buick recognized that there was a cooling problem and redesigned the fan postwar. 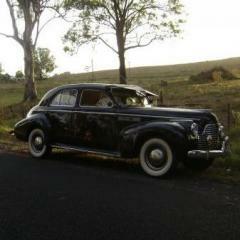 I installed a 1952 Roadmaster fan on my car and it does cool the engine a bit better. For a while things were busy at work so I hadn't made any progress on the car for about 4 weeks. I have some time off until after new years so I'm making the most of the car project despite the hot weather. I have reassembled the rear axle. Somebody in the club had a rebuilt 4.1 ratio center with NORS ND and Hyatt bearings. I'm hoping i'll notice some difference in RPM for highway driving with the lower ratio. I wasn't able to find any NORS wheel bearings so i bought some China made ones from BOBs. The propeller shaft came off quite easily on the old pinion shaft spline with some light tapping with a hammer. It was very tight on the new centers spline so I clamped some steel up against the pinion gear and then used a jack between the doorway of the shed to press on the propeller shaft. I went very slowly making sure I wasn't bending the shaft in the process. Now that you have taken your rear axle assembly nearly completely apart, you have become the expert for my question. In the photo below I am pointing to a set screw with a locking nut on the differential carrier. The carrier has two of these. I've read my 1940 shop manual and there is no mention of them, at least as I would recognize a description. 1) What do they do? 2) Do they require any specific adjustment? Another detail that I don't see covered in the shop manual very well is the torque tube removal and re-assembly. The shop manual says that the torque tube and differential carrier should not be separated. Do you know why? I've spoken to others who like you separated these parts and others report that they had no problems afterward. There is a thin gasket or spacer that I am pointing to in the photo below. The shop manual says these are "special" gaskets. I can't determine what the gasket even seals. What are your thoughts? Did you replace yours? Source? Grampa is right, so if you can find a '52 Roadmaster fan please put it on. I could not find one, so I used a 6 blade "flex " fan, and painted it black. Plus I had a 18 " pancake" electric fan in front of the radiator on a toggle switch under the dash board. Used it a lot on some long pulls up hill. Since I live @ 8500 ft. the air is much thinner and we are either going up hill or down. I had to replace the "mains" in the carby and go down 2 sizes to get the plugs to show a decent colour. A little Aussie spelling don't ya know. Regarding the bypass valve, there are many many forum threads pertaining to overheating. Please do a search and read up on these, particularly if you are going to use her as a driver, and not a trailer queen. 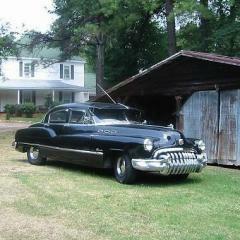 The '39's and '40's Buicks were noted for overheating, and my LTD was no exception. It wasn't until I did the bypass fix with a frost plug drilled with a 1/4" hole in the center that I finally solved the problem. It helps the hot water exit the front of the head. In the photo below I am pointing to a set screw with a locking nut on the differential carrier. The carrier has two of these. I've read my 1940 shop manual and there is no mention of them, at least as I would recognize a description. 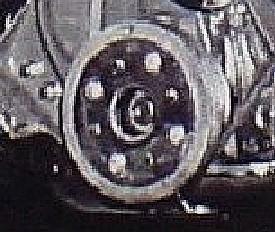 They push forward a collar that holds the front pinion bearing in place (by forcing it to the bottom of it's bore. FIrst, one makes sure the collar is all the way forward, then the 3 set screws are tightened evenly, (probably with a torque wrench by 1940). Once the set screws are torqued, the locking nuts are tightened down against the case to lock the set screws in place. Yes, you are correct there are three. If I remove and replace one set screw at a time will I upset any pinion positions? I want to replace them with others that I have as this differential came from a junk car that sat on the ground for decades. The screws are in very poor shape though apparently holding. Adding further to the story, this differential has the 3.6:1 ratio so I've swapped the carrier into my axle and torque tube. The axle housing and torque tube that sat on the ground has severe pitting but the interior of the differential was in great shape. They only have a torque value. There is no adjustment to upset. IMHO the only danger is the support ring falling out of position if you removed them all. If you do them one at a time and torque to spec, then tighten the locking nut, IMHO there should be no problem. Re. engine running hot - - - A friend had a 1941 Buick Super in his shop that was running too hot. 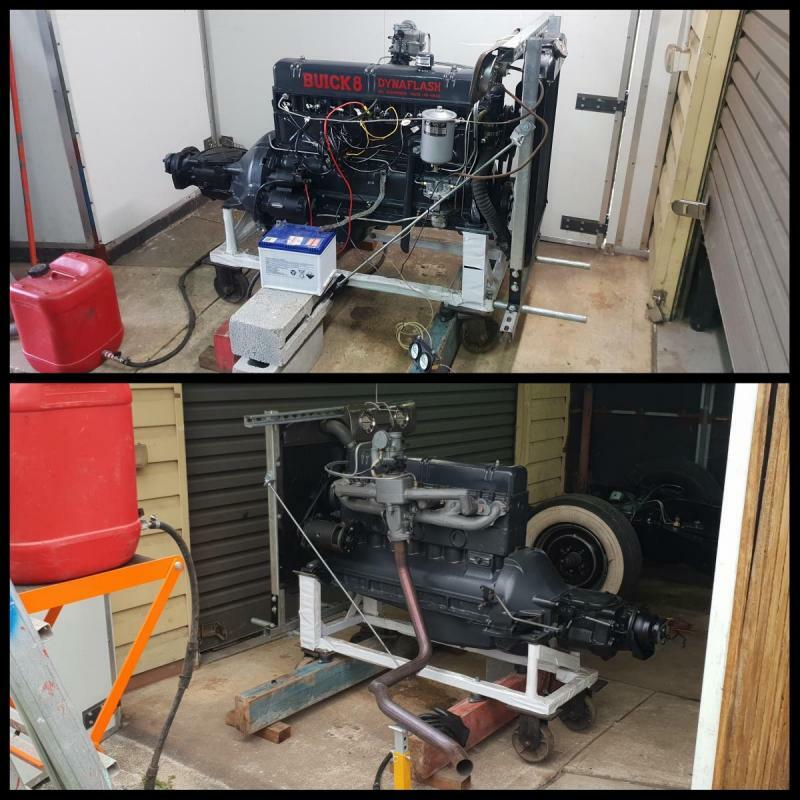 The engine had been hot tanked and rebuilt by others. With the use of a pressure washer (garden hose water connection and a compressed air connection) he cleaned out the water jacket in the back of the block through a water pump opening. He used a straightened coat hanger to reach the rust debris that had accumulated in the block. The cleaning took a couple of hours, but yielded a lot of rust debris. Also, note the finishes on the shock absorbers and the generator pulley. I did my '40 with a 1/4" neoprene hose adapted to a garden hose while she was still in the car, when I first got her. Taped a big sheet of plastic over the radiator, and a big pan underneath the car, just to see what came out. My pile looked like yours at the bottom of the tub. It helped, but did not solve the overheating. The next year, I put 3 gallons of Evap-o-rust in her and drove with it for about 2 months. Worked so well, I had to replace the front and rear frost plugs. But she was squeaky clean, even at the bottom of the back cylinders. The bypass fix turned her into a long distance cruiser @ 180 degrees in mid summer. Is that correct? I've always seen the shocks chassis color. The factory photos of the assembly of 1941 Buicks at the Linden, NJ, plant clearly show the shocks painted chassis black. I would go with a black finish. Grandpa: How would you interpret the harmonic balancer finish in that picture? The harmonic damper is fitted to the engine after the engine is painted. I am not sure what the correct finish is for this part. From the factory photo, it appears that the damper has a couple of different finishes; it looks like the pulley on the damper may be cadmium plated. I will have to check into the correct finish for this part. You're right I must have skipped past that text in the manual. They manual says its because the tube and carrier are matched and lined up during production but I think it may be Buick just being extra cautious. It's pretty common for owners of 1940s Buicks to completely swap the differential carrier with Buicks up to 1955 and I haven't heard of any problems. I didn't take much note of what the manual said because I had just followed the instructions from club members who had done this procedure many times before. I replaced the gasket. I ended up buying it from Bob's Automobillia, it just looked like ordinary paper gasket. 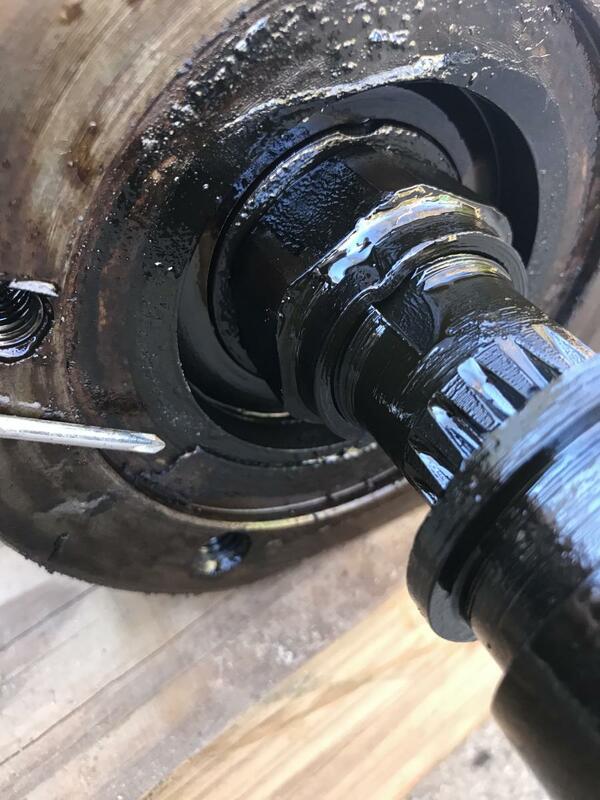 Oil from the diff can leak past the pinion bearings into the torque tube and so it stops oil leaking out out the connection. As Bloo pointed out there are 3 of them and I believe they lock the pinion in place. It does appear the 1940 manual skipped past the part about these nuts and removal of the pinion. 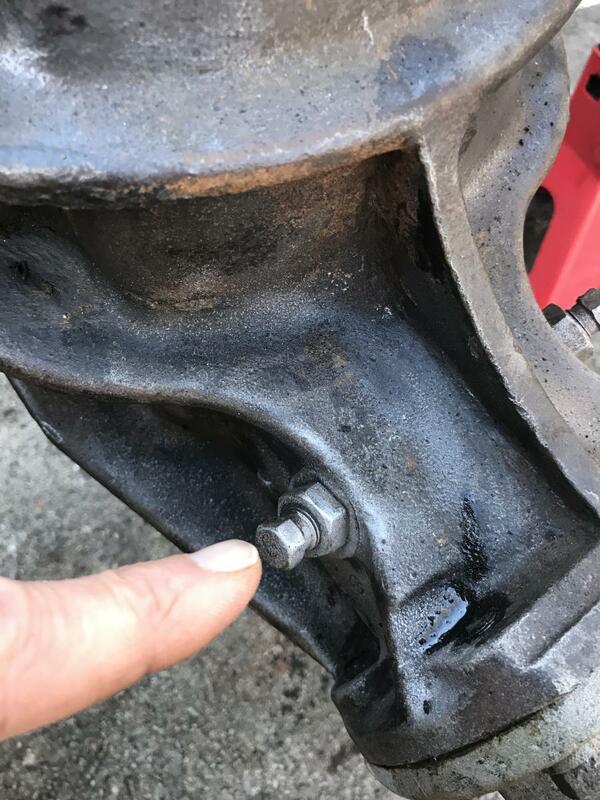 I didn't have to touch them because when I bought the differential carrier from a 53 model Buick the pinion bearings and side bearings had been replaced and set correctly so all i had to do was just simply bolt it onto the axle housing and torque tube. This is one of the detailed restorations that studied closely. The brake backing plates are cad? plated too. I assume Bill Anderson had access to an illustrated components book for 1941 models. Perhaps different factories did things differently as there are many conflicting differences in finishes between this restoration and the original photographs you presented. That is a part of much discussion. Some cars have the rivets drilled out and replaced with bolts (some say dealers did this all the time back in the 40’s and 50’s when performing maintenance.). There are also 2 different versions on the shafts. Some are threaded into the eye (and have a larger eyehole) and some have rubber in the eye hole. Mine are threaded into the eyehole (like yours it appears, and if so, I would love to know how to order the correct seals). When I ordered the seals, I was sent the incorrect ones and told my arms were incorrect for my car. Many people have mixed and matched these over a few year period. Apparently they fit many years. As as far as putting the shaft back in I pried them apart. I put one end in first, then used a giant screwdriver through the other hole for leverage and pulled while someone else got it started. I told Dad we could drill the rivets out and replace them with bolts, but he didn’t like the idea of changing it. I just went and had a look at your control arm arm, they look the same as mine with the steel bushing. The dirt seal to buy would be https://bobsautomobilia.com/suspension-and-steering/lower-inner-shaft-seal-1937-57-ss-378/ but the only way to get them on is to drill out the rivets. 37 and 38 had steel bushings with smaller bolt spacings on the shaft. I would assume 39 had the same bolt spacings as the 40 and up models but had a rubber bushing which is apparently replaceable. 40-42 had a composition bushing in a steel shell that didn't require lubrication, with a larger spacing in the shaft bolt holes. 46 and up went back to steel bushings. Mine had been converted to the steel bushings but they left off the seals because they didn't drill the rivets. Now that I've seen your lower arm bumper again I see it must but the type that a bolt keeps in place. I bought the original trapped mounted type which requires the again drilling of the rivets to install. 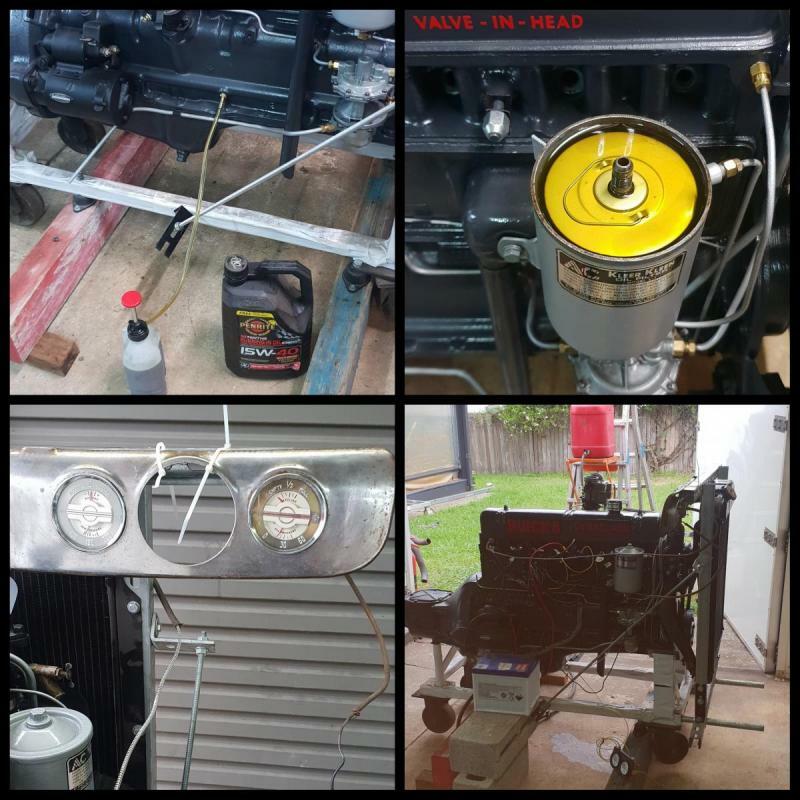 Yesterday I set the Engine up for a test run. I had run it 1 and a half years ago but couldn't run it for long because of overheating. I went overseas shortly after which I why I couldn't diagnose the problem at the time. After being able to run the engine for half an hour this time with a steady temperature I put the problem down to the thermostat being wrong side up. 1. After a little research and finding many mixed opinions about the generator running I removed the brushes and also the field coil because when I opened it up I found it very dirty inside so I cleaned it out. So I reinstalled it with just the armature and casing so that nothing could be generated. 2. using a hand pump i pumped 'running in' oil in through the gallery, tipped some in the rocker cover and filled the filter canister. 6. Check timing in distributor with the help of a friend. While I was turning crank he watched marking on the flywheel and checked valve movement was in correct sequence. reinstalled rocker cover. 10. cranked engine over to with no spark plugs, checked oil pressure reading on gauge and that fuel pump working and fuel at carby. There were a couple of leaks in the fuel lines fittings but after tightening them up the leaks stopped. Ran good for half an hour but the oil pressure was starting to drop off at the end was around 25psi. is this normal with running in oil? Some of the oil line brass fittings leaked too, will probably have to buy new ones as the old ones are starting to strip and cant tighten much more. I used the gauges from the dash because I had them re calibrated and wanted to check they worked and also another new oil gauge to compare readings. That's what second gear is for! Seriously, I installed a 3.36 to 1 in my '50 with 248 CI.. I had no problem, or at least none I recall.